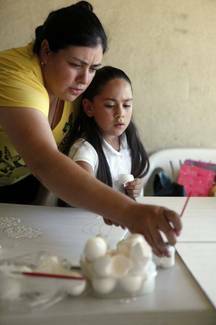 As briefly mentioned before, California's Modesto Bee recently took a fantastic look at the Hispanic-Latina Initiative rolled out by The Girl Scouts Heart of Central California. It highlights the benefits of girls getting to see their Spanish-speaking moms in leadership positions, so they can better visualize themselves heading everything from Girl Scout troops to companies in the future. There is also a cool slide show including pictures of Girl Scouts making eggshell mosaics of things that pertain to various aspects of their Hispanic culture. Definitely check it out! The Miami Herald has an article about Girl Scouts throwing quinceañera parties for South Miami-Dade teens. In Hispanic cultures, the quinceañera coming-of-age ceremony marks the transition from girl to womanhood. The Girl Scout Council of Tropical Florida recently organized a grand quinceañera celebration for a group of young ladies enrolled in the Girl Scouts' Uniquely ME! self-esteem program. The six-week program is designed for girls ages 14 to 16, with activities like community service, and lessons in goal-setting, etiquette, personal hygiene, health and nutrition, and cultural traditions. The Fiesta de Quiceañera, in its third year, also symbolizes graduation from the program. Held at a ballroom this year, the reception featured music, Mexican food, cake, flower arrangements and professional photography. The girls wore traditional princess dresses, tiaras and pink tennis shoes. They later slipped into high heels with the help of their parents, a typical component of quince ceremonies. Sounds pretty awesome to me! Do you have similar stories that you would like to share?